Earn 845 loyalty points when you order this item. 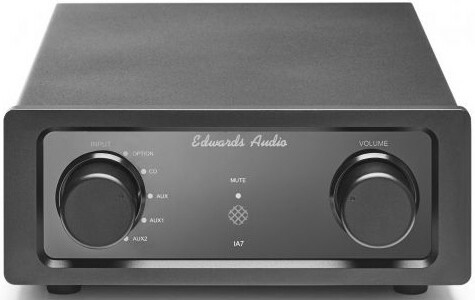 Edwards Audio IA7 Integrated Amplifier is based on the original award-winning IA2R model featuring an improved linear power supply which is a custom wound 325VA toroidal transformer. With many years of work and development with the transformer supplier, the result is a guaranteed ‘silent’ transformer, which will be a sweet sound to anyone’s ear. This new and improved transformer increases the power output to 80W, and improves current and drive making it capable of driving almost any speaker out there with ease. The new IA7 has DC blocking on its AC input, which removes any unwanted DC on the incoming mains supply. It features a back lit Blue LED acrylic front panel display with a 9mm thick custom machined outer frame. 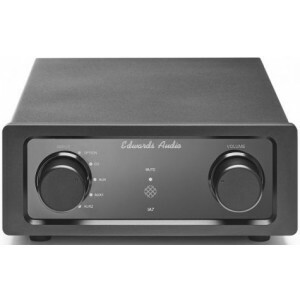 With no buttons on the front it gives an uncluttered feel to the amplifier. The smooth turning controls for the volume and input selection are via 40mm dia turned aluminium control knobs, which are finished in a black anodised bead blasted finish. It has a total of 5 inputs: 4 of which are line-in, including a single pair of outputs for recording purposes, and one is an OPTIONAL RIAA MM board for use with MM cartridges like the C100. 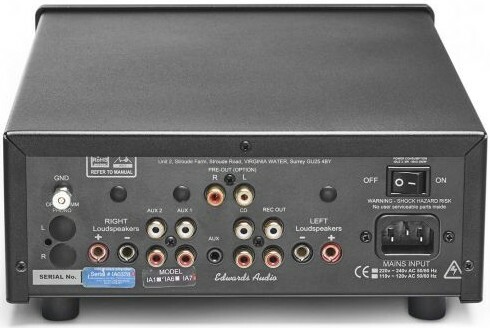 The IA7 also incorporates a Pre-amp output for use in active or multi-amp systems. A 3.5mm auxiliary jack is also included for other sources. The IA7 makes an ideal partner with all new SP7 floorstanding loudspeakers, and equally the all new forthcoming TT7 turntable when plugged directly into the optional internal custom designed RIAA MM input board. This makes for a very well balanced and solid musical system who’s performance belies it’s modest price tag.